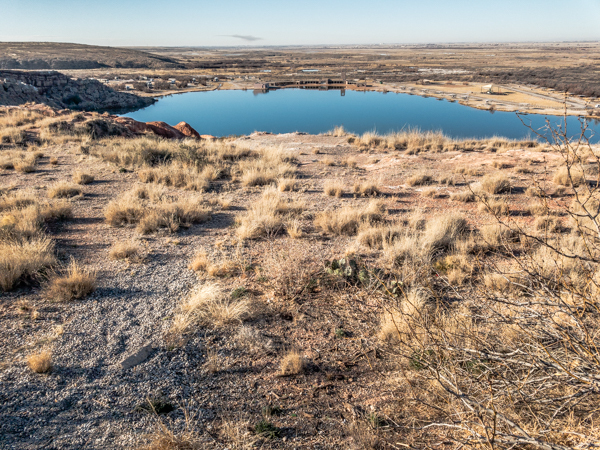 We know that the bats will not be in residence in Carlsbad Caverns in January. They normally return to this National Park in early Spring and stay through October. We decide to visit in spite of their absence. The return of the Brazilian Free-Tailed bats coincides with an influx of thousands of tourists according to a gift shop employee. 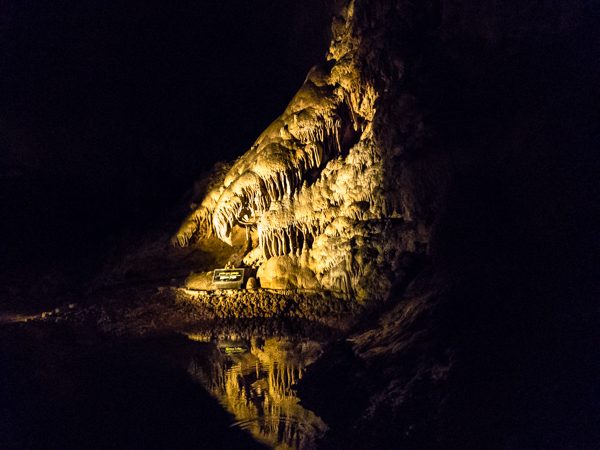 Without the attraction of the bats to lure in more visitors, we have the cavern almost to ourselves. 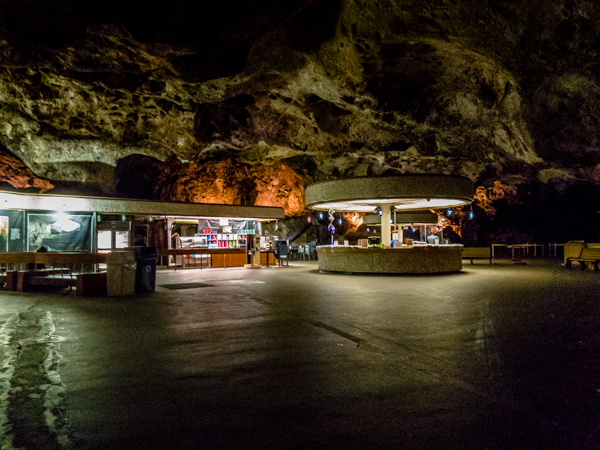 At the ticket desk, we learn that we have options regarding our tour of the main cavern. We can combine the up and down options in any way we chose. An elevator is available to lower us down or return us back up 75 stories to and from the Big Room. 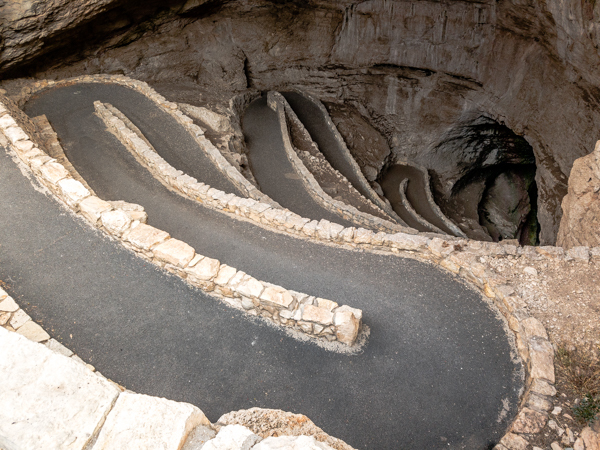 For more exercise and scenery, we can follow a winding path down 75 stories via the Natural Entrance to the Big Room. If gripped by insanity and a total disregard for our lives, we can climb back UP to the Natural Entrance via the same walkway we took down (that’s not gonna happen). We chose to stroll down and ride the speedy, ear popping elevator back to the surface. I called this one "Almost"
We carry a flashlight with us as we begin our descent and it certainly comes in handy. Although the cavern path is dimly lit, my old eyes still see more shadows than light. I am a little concerned when we meet no one else on the first mile down. What if something happens? Sound carries extremely well inside the cavern so if we need help I guess we can holler. We keep our voices to a whisper for conversation and it is eerily silent as we make our way down. 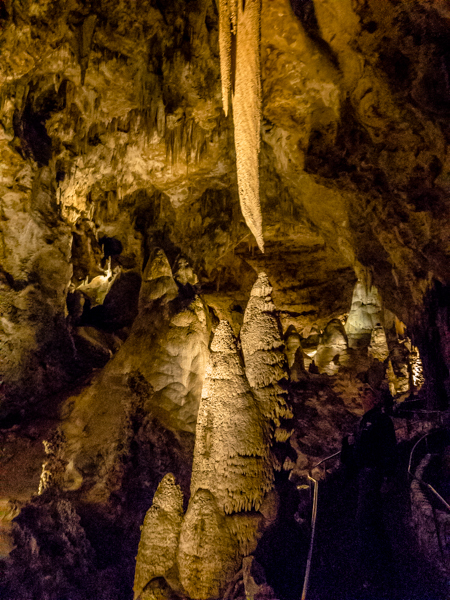 About halfway to the Big Room, I am startled by what at first appears to be a stalagmite in my path. Instead it is just a very quiet Ranger keeping watch on this section of the walkway. 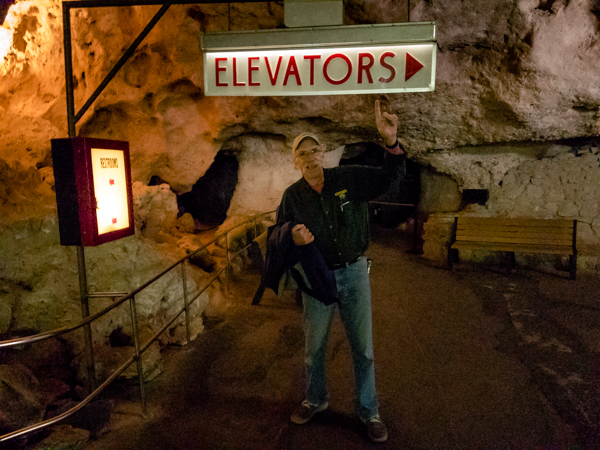 The self-guided tour down the Natural Entrance and through the Big Room is about 2.5 miles and takes us about 3 hours. The Big Room, a 14 football field size section of the cavern, delivers a self guided tour that has us exclaiming (very quietly) in amazement at every turn. Ranger guided tours to other parts of the cavern are available, but you have to plan ahead for those and reserve in advance. 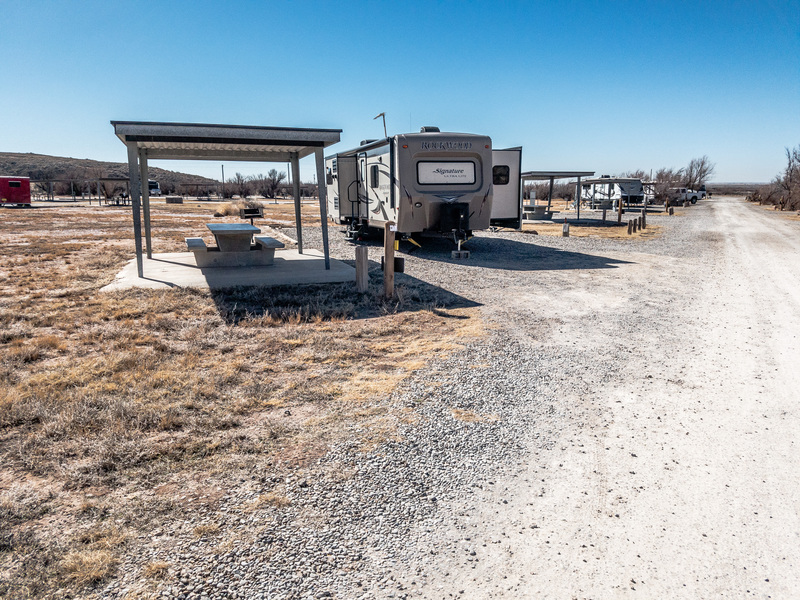 We stay 2 nights at Bottomless Lake State Park about 14 miles outside of Roswell. The price is great at $14 per night with water and electricity. However, Storm is very disappointed that no outer space aliens join us in this remote location. 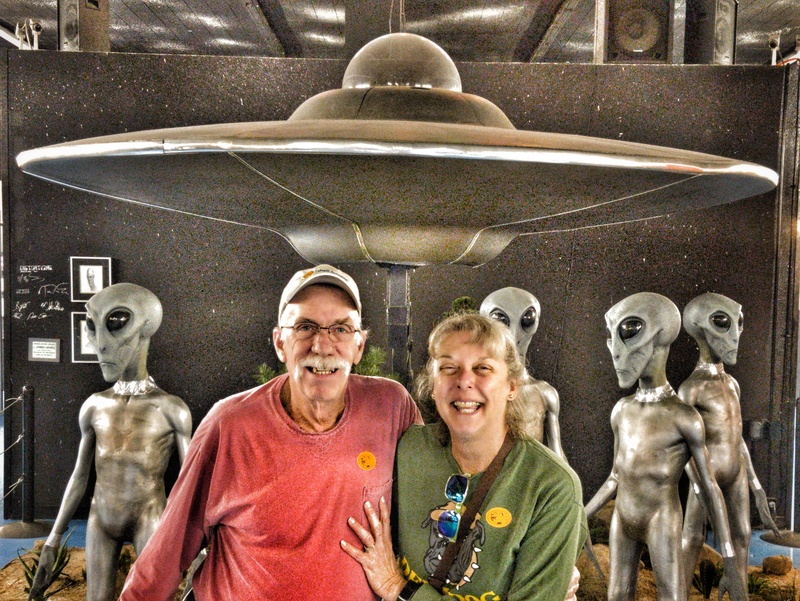 To console him, we stop at the UFO Museum on our way out of town. 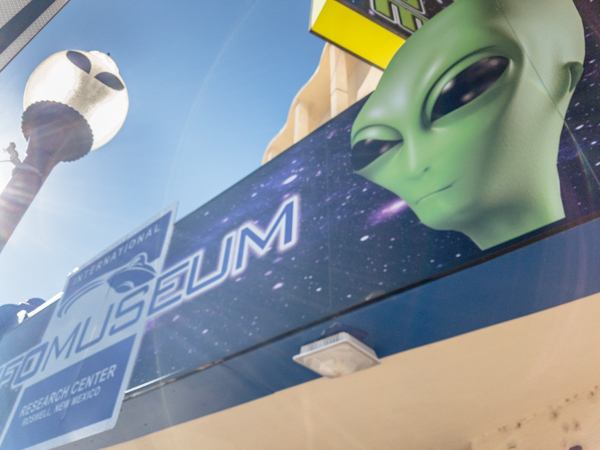 We learn all we need to know about the alien mystery at this Roswell museum and the $3 senior ticket price is extremely reasonable. An alien landing animation flashes light and smoke from little silver men every 15 minutes or so making this visit almost like being actually abducted! 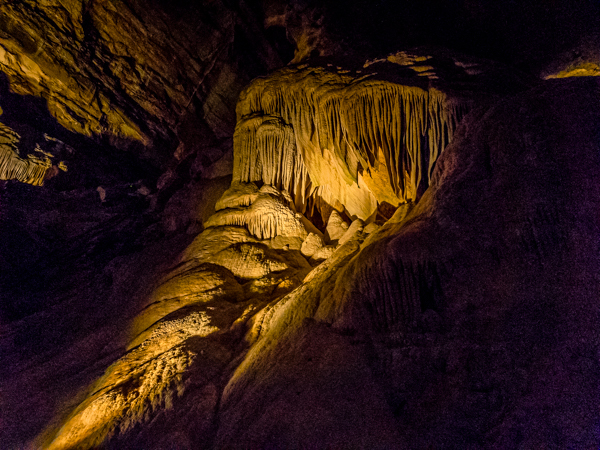 Most of our pictures were black (natural lighting of the cave), but this one shows a well lit feature. 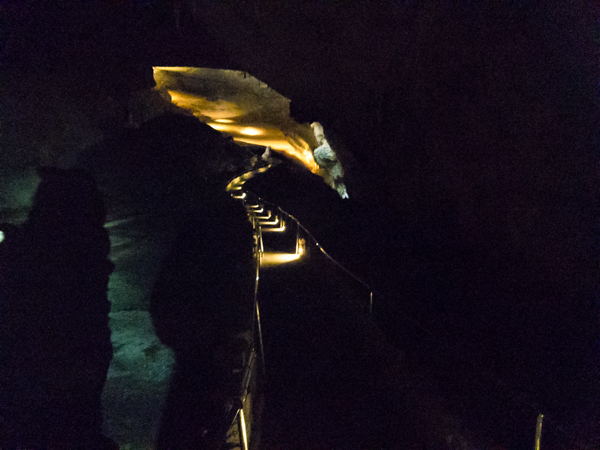 Almost too dark to capture this rare pool of water - most of the cavern is dry. Our chosen option to end our tour. View of Bottomless Lake campground across Lea Lake. “Watching” the bats not come home reminds me of going to San Juan Capistrano CA on March 19th a few years back. We were expecting the skies to darken with hordes of swallows returning to spring nesting at the old mission. After seeing maybe ten birds all freekin day long, we were informed on the QT by a gift shop cashier that mission restoration had destroyed all the mud nests/houses formerly stuck to rafters, eaves, roofs, etc. The birds were pissed off and flew on by to local river bridges and built new nests there, never to return to the old mission. San Juan Capistrano, once a major tourist mecca, was now a few surviving shops desparately hawking refrigerator magnets. Hope you do better with the bats… Keep some Murine on hand for when the guano piles beginning burning your eyes … ?. je, a.k.a. “Foul Weather”. Oh no – what a disappointment! At least we got to check out the amazing cavern even though we saw no bats 🙂 Thanks for the tip on the Murine! 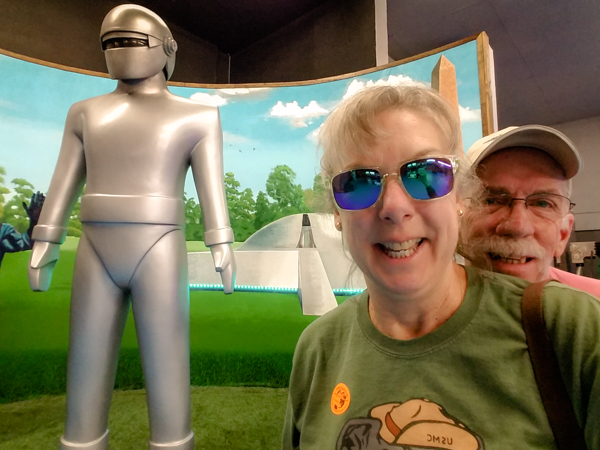 We found Roswell fun and every time an alien reference comes our way we think of the alien museum. Did you get the T-shirt? Its one of Terrie’s favorites. Never did make it to Carlsbad that hike might be out of the question for me so I’ll enjoy it vicariously through your pictures. 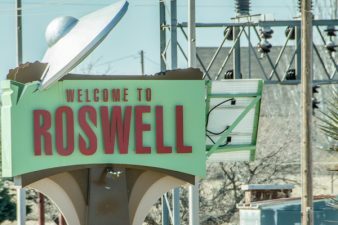 We forgot to get a Roswell T-Shirt!! Guess that means a road trip back some time. Maybe then we will catch the bats. You would be fine if you took the elevator both ways. The Big Room tour is very level with lots of shortcuts and seating everywhere. I was impressed with this park especially at this time of year. I imagine it gets a little crazy when the crowds and bats return.